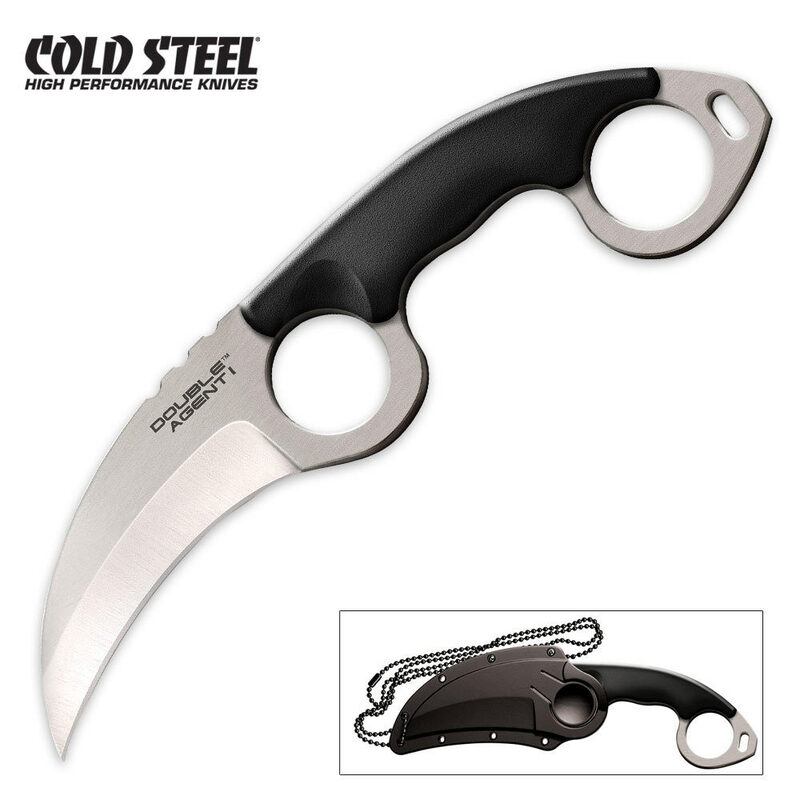 Cold Steel Double Agent I Neck Knife | BUDK.com - Knives & Swords At The Lowest Prices! This knife is an amazing piece of craftsmanship. I have to admit, when I looked at it the first time it seemed like it would be a little awkward to hold, but it is definitely not. It fits in your hand incredibly well, and the size is just perfect. Maybe not so much for a neck knife, but as a concealed weapon it does the job amazingly well. The blade didn't come sharp, but as the other said it was easy enough to fix and it does hold an edge very well. Sheath is unique, and holds the knife very securely. This knife will definitely NOT be wrestled easily from your hand. It is also very comfortable to hold in reverse if that is your preference, and as I said easy to conceal. I bought this knife a couple of weeks ago as a pair with the Double Agent II neck knife. Both knives in this pair are excellent quality. This knife is so lightweight it's hard to believe that it is so sturdy. The curved blade is fantastically sharp (I did smooth up the edge a bit, just a few strokes with a sharpener did the trick), and I can tell you it will definitely hold its sharpness. The knife is a single piece of steel, with the grip added this knife fits perfectly in my hand, both in regular and reverse grip. I got everything I was looking for, shipping and delivery were very fast, and this is now one of my favorite knives (along with its partner the DAI). I will definitely be a repeat customer.